The Creative York galleries present bi-monthly solo and group exhibitions of regional, national, and international works. Conveniently located in the heart of the Market District of historic downtown York, our galleries are some of the premier exhibition spaces of South Central Pennsylvania. We choose to feature innovative new artists, local favorites, experimental installations, and diverse art forms to give art enthusiasts a uniquely inspiring experience every time they visit. All exhibits are free for everyone to enjoy thanks to generous funding from our donors and supporters. 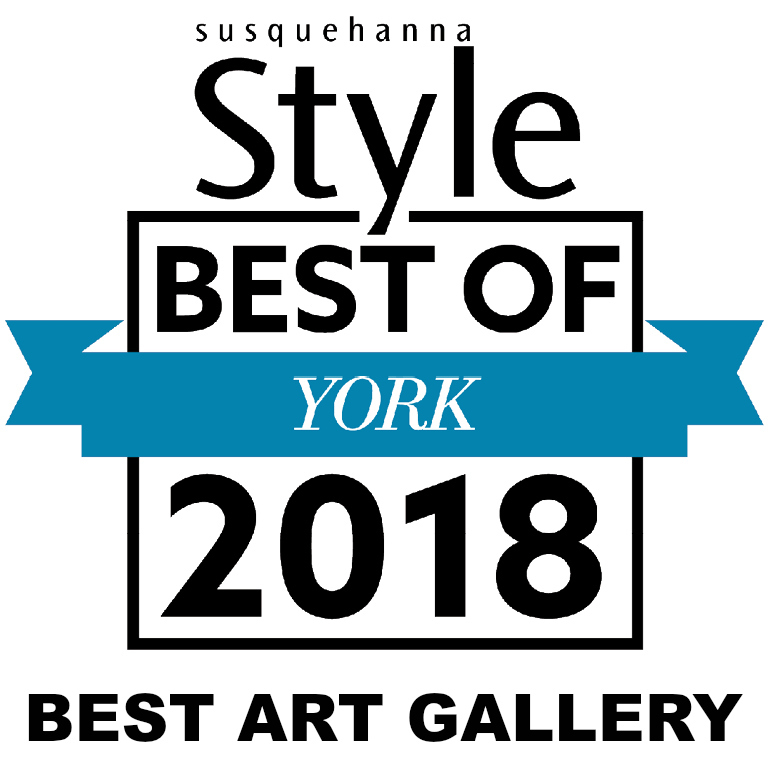 THANK YOU to the readers of Susquehanna Style Magazine for voting Creative York “Best Art Gallery” in York for 2018! All Kerlin Gallery exhibits are curated by our Director of Exhibitions unless otherwise noted. BLUE is a group exhibit of artworks featuring blue as the predominant color or focal point. With artworks by: Peg Belcastro, Pamela Black, Robert Buchanan, Holly Davis, Valerie Dillon, Ellen Engdahl Ehlenbeck, Rob Evans, Beth Fowler, Jonathan Frazier, Bonnie Gloris, Cheryl Handy, Judeth Pekala Hawkins, Jodi Hoover, Gale Jamieson, Jessica Lee, Christine Mercer-Vernon, Janice Moore, Fiel Patricio, Sue Reno, Julie Riker, Justin Ritmiller, Nicole Smeltzer, Andrew T Smith, Linda Sommer, Adrienne Stein, Marion K Stephenson, Anita Williams, Kim Jordan Wojciechowski, Autumn Wright, and Terri Yacovelli. IDENTITY is a group exhibit of artworks examining the various components that make up our identities, be it cultural, historical, gender-based, physical, intellectual, adaptive, transformative, or any of the many other elements and experiences that shape and define who we are. Each artwork is presented with a statement by the artist, encouraging a connection between the artwork and viewer, and hopefully sparking conversations beyond the exhibit itself. Participating artists: Ibiyinka Alao, Rosa Luz Catterall, Abigail Crone, Miguel Cruz-Cuevas, Michael W. Dugger, Shelby Elaine / Inclusive Arts Movement York, Brigitte Errickson, Lexus Gore, Gale Jamieson, Judeth Pekala Hawkins, Stephen March, Allison Moats, Janice Moore, Doug Puller, Jimmy Purkey, Ivy Rodgers, Dillon Samuelson, Debra Strausbaugh, Mary Louise Sullivan, James Tompkins, d. g. walczyk, Alyssa Waller, Leah Limpert Walt, Kay Wrenn, and Terri Yacovelli. A group exhibit showcasing available works by some of the artists featured in our April 27th Art In Residence gala event – a one-night-only exhibit of works from privately-owned collections. Participating artists to be announced. Creative York is proud to showcase a selection of artworks by our artist members. Participating artists to be announced. Artist Awards announced at 6:30pm, followed by the winners of the YorkFest Adult Literary Competition at 7pm. Submission period: April 17-June 15, 2019. Submission instructions will be posted on April 17. A group exhibit celebrating the art and culture of the indigenous people of the United States. Participating artists to be announced. Our annual “100 Under $100” exhibit is a small works exhibit boasting over 100 pieces of original art by 100 local and regional artists all priced under $100. Join us for the opening reception on Thursday November 28 from 6-8pm to get first pick of the artworks, which just happen to be great for gifting, too! Participating artists to be announced. WATER ER is an educational, multi-media traveling art exhibit focusing on the Susquehanna River – one of, if not the oldest river in the world and the longest river on the east coast of the US. The exhibit content expands further to the Susquehanna’s River’s major tributaries reaching the Chesapeake Bay and into the World’s Oceans, as all the waters of the world are connected. Participating artists include: Sela Bowman, Chelsea Caroline, Meisa Chase, Savannah Schroll Guz, Brandon James, Bryan Murch, Vanessa Nelson, Kate Rush-Cook, d.g. walczyk, and Carmen Walsh. The Secret Garden is a personal account of an all too common yet painful narrative of the female experience. Just like a garden, female bodies have the ability to produce growth and endure loss, source pleasure and inflict pain, as well as create life and induce death. Through this installation, New York artist Carlie Sherry shares her story with the hope of empowering women to talk about this subject as it is often dealt with in secrecy, to have no more secrets in this garden. a collaborative educational exhibition between Ophelia Chambliss and Matthew Apol. Contrast is a visual representation of parallel experiences of race and racism across divergent perspectives of age and ethnicity. The function of the exhibition is to highlight, describe, and elaborate on the significant events regarding the differences and similarities in the ways that each artist has encountered and experienced racial tension over the course of their lives. Ophelia Chambliss is a female African American artist born in Chicago, Illinois. Matthew Apol is a male Caucasian American artist born in Michel, South Dakota. With nearly 25 years between them, different ethnicity and geographic location has led Chambliss and Apol through two very different experiences regarding discrimination. Contrast offers viewers the opportunity to compare these experiences side by side and in contrast to each other. To explore the perspective of two very different individuals while examining a very non-individual system of manipulation. This installation curated by Nacole Gaines begins with the race riots of 1969 and follows through the progress the York City has made regarding race relations, highlighting black and white leaders in the city of York that were and are instrumental in improving the City of York. Artist opportunities at Creative York: If you are an artist looking for opportunities to exhibit at Creative York, please click HERE for information about upcoming Calls For Art and submission information about The Project Space. Situated in the heart of downtown York’s vibrant Central Market District, Creative York’s gallery is the up-and-coming space to hold your next special event. Creative York invites individuals, corporations, and non-profits to host meetings, receptions, press conferences, parties, lectures, and screenings in this unique facility. The ambiance in our recently renovated Kerlin Gallery exudes warm elegance mixed with upbeat artistic funkiness and there’s always a great exhibit hanging on our walls! Located at 10 N Beaver Street. Give us a call at 717-848-3200 or e-mail susan@creativeyork.org to reserve a date. PLEASE NOTE: Because of the nature of Creative York as an educational and cultural institution, the need for protection of the objects displayed in the building and the building itself, Creative York reserves the right to refuse to make its facilities available to any prospective user for any reason whatsoever. Our facilities are available when it does not conflict with the scheduling and mission of Creative York. Pro Tip: Need a caterer? We have some tasty solutions we can share with you.